885 saplings of fruit bearing trees were planted by 255 students of various schools in Biswanath, Sonitpur, East & West Karbi Anglong Districts of Assam. 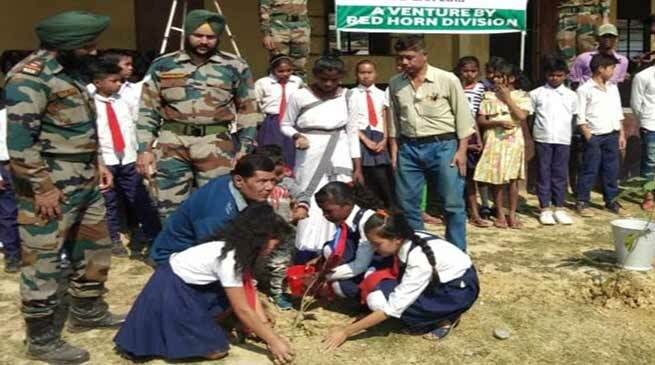 As part of Military Civic Action, Units under Red Horns Division of Indian Army organised a Tree Plantation Drive on 25 January 2019 with an aim to spread Environmental awareness and importance of planting trees. A total of 885 saplings of fruit bearing trees were planted by 255 students of various schools in Biswanath, Sonitpur, East & West Karbi Anglong Districts of Assam. Also, The Chindit Battalion of Red Horns Division conducted drawing and painting competition on 25 Jan 19 for the school children of Tamulpur High school, on the occasion of 70th Republic Day Celebration. The aim of the event was to promote talent, creativity, spirit of competition & to provide a platform for the bright minds to colour their imagination. The event witness great participation by young girls & boys of school.